Gentle Reader, are you tired of your mundane, cookie-cutter, American surroundings? On Friday, 4/21/05, I was fortunate enough to be "magically transported" from dirty ol' Berkeley to the South of France and then to the Middle East. Restaurants that focus on the cuisine of a particular country, city or region tend to appropriate the decor of that country, city or region to match the food. Some diners serve up nostalgia for the 1950s not only in the greasy food but with jukeboxes and posters of Elvis, neither of which were abundantly found in diners back then. Chinese restaurants in the US have traditionally hidden bottles of soy sauce behind faux-lacquer crimson dragons, which, Gentle Reader, if you have never been to China, really do function as guardians soy sauce bottles. La Note is not a Chinese restaurant; rather, it offers "Authentic Provencal [sic] Southern France Cooking" mainly in the form of breakfast and lunch to Berkeley's francophile population. There are certainly many French touches to La Note's decor--wooden tables and chairs, specials written out in chalk on a small blackboard in that floppy French handwriting, and a courtyard in back for outdoor dining. In an another bold move, La Note provides unwrapped lumps of turbinado sugar (which people pick up and put back with their dirty, unwashed hands) in sugar caddies for coffee sweetening purposes. Compare this to most other restaurants, where the sugar is kept safe and hygenic in factory-sealed paper packets. Arriving shortly after Gloria Kim, editor emerita of hardboiled, we took advantage of the oddly rare sunshine by taking our seats in the courtyard. Menus came promptly, but our decisions on what to eat did not. In the mood for something with tuna, I considered getting the salade Niçoise before settling on the pan bagnat. 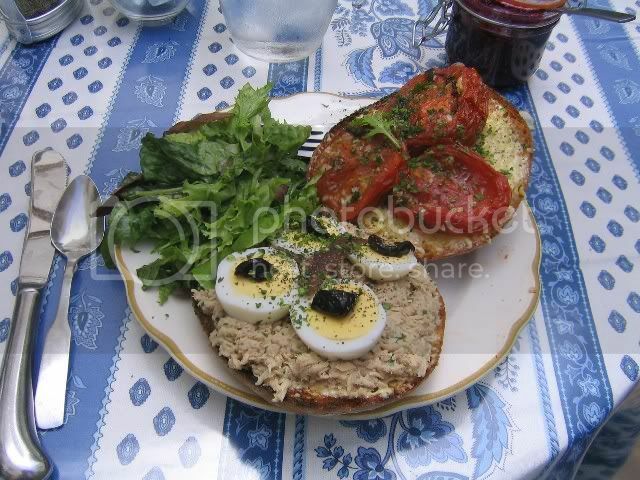 This particular pan bagnat consisted of tuna salad, roasted tomato, sliced hard boiled egg, one niçoise olive placed neatly on each egg yolk, an anchovy fillet and aïoli on a crusty roll. Basically, I got the salade niçoise on a roll with lettuce, which the French call salade, on the side. It tasted balanced between the salty richness of the fish and aïoli and the bracing taste of the roasted tomatoes and neatly dressed greens. Gloria ordered a "Côté Ouest," one of La Note's combination breakfasts. 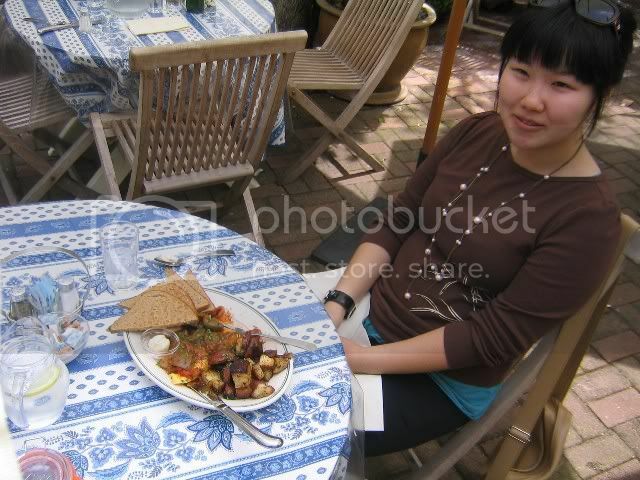 This particular one was a 3-egg omelette filled with ratatouille, next to a side of home fries with toast. While I have typically enjoyed this combination, Gloria found off flavors in it that particular day. As they say in France, "Quel dommage!" I have granted another exception to the Friday Lunch Series being about lunch on Fridays because on this particular occasion, it was my friend Iris Yuan's 24th birthday. But it still was on a Friday! Kan Zaman, located in San Francisco near the western end of Haight Street, tries to immerse diners in an intimate Middle Eastern setting complete with low tables, dim lights and the flags of Arab League nations hanging from the ceiling. Kan Zaman's fame lies not with their food (pretty good but not special) but with their hookahs (water pipes for flavored tobacco) and their notoriously surly staff. Though they have an à la carte menu, we got a set combination dinner, which lends itself nicely to large groups (such as ours of around 12). Sitting on cushions that may or may not have been dirty (we could not tell due to the dim light), started out with carafes of spiced wine. Made of red wine and spiked with citrus, cinnamon and clove, the spiced wine proved to be an aromatic alpha and omega to the meal. It wasn't supposed to be the opener; it just took the kitchen and waitstaff that long to bring out pita bread and the cold mezze. We passed around pretty good hummous and tangy cucumbers in yoghurt. These were followed by falafel, then chicken and vegetable kebabs over rice pilaf. While the food was tasty enough, the clear winner was the spiced wine. Even though it was Iris's birthday, the waitstaff refused to bring the celebratory hookah to the table, making Iris & Co stand at a small table in next to the bar, where they were constantly shoved by angry waitresses. The ill-tempered staff complained when we said that our party was going to have another person arriving late. Additionally, they left it ambiguous as to whether or not the gratuity was included in the bill. Because of that and other confusing bits, dinner guest Edgar Quesada ended up with a $90 chargef on his credit card. And they didn't even say thanks! If that's what Middle Eastern hospitality is like, then I'm glad that they saved me the trip out there. It's great to read something fresh. Keep these coming, please!